And now these three remain: faith, hope and love. But the greatest of these is love (1 Corinthians 13:13 NIV). With Christmas just around the corner, it’s easy to get so busy with the cooking, decorating and shopping that we forget why we’re doing all this in the first place. Sometimes, the very people we love get lost in the hustle and bustle of packed schedules, holiday parties, and Christmas musicals. Several years ago I wrote a Christmas version of 1 Corinthians 13 to help me keep my focus on what Paul deemed most important of all…love. As part of our family tradition, I pull it out and post it somewhere in our home as a reminder of what’s really important during the holiday season. And since you are now part of the family, I’m pulling it out for you. Love never fails. Video games will break, pearl necklaces will be lost, golf clubs will rust. But giving the gift of love will endure. Heavenly Father, thank You for sending Your Son, Jesus, on that starry night in Bethlehem. I am still amazed at Your great love for me. May I never lose sight of the true meaning of Christmas, but celebrate Jesus’ birth with joy! Help me to give as You gave—with love. What are some ways that you can make sure to love your family well this holiday season? Are there any activities that you need to eliminate from your busy schedule in order to alleviate over commitment? If so, what are they? It is hard not to get caught up in the pre-Christmas swirl of activity and lose focus on what’s really important. If you would like ways to keep Jesus the focus of your holiday season, check out my book, Celebrating a Christ-centered Christmas: Ideas from A-Z. It’s packed with helpful ideas and inspiration. And what could be better than giving the gift of prayer? 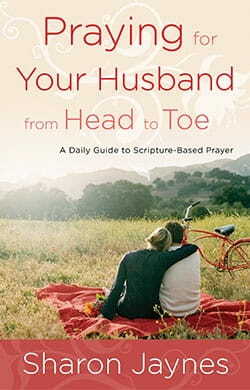 For you married gals, check out Praying for Your Husband from Head to Toe.